Maven scores Series B funding to expand its return-to-work product line. Maven, a digital health clinic that caters to women and children, scored an additional $27 million in Series B funding this morning. The round was led by Oak HC/FT with participation from Spring Mountain Capital, 14W, and Female Founders fund. The digital health platform was first founded in 2014 and is focused on linking women and families to providers. It also helps users book video appointments and send messages to services including health practitioners, OB-GYNs, midwives, therapists, and nutritionists. The new money will be used to help expand its return-to-work care products, including a new breastmilk shipping service. The company said it hopes to provide more resources to women who are still in the workforce after giving birth, noting that less than half of women who give birth go back to work after they have children. However, according to the US Department of Labor mothers are the primary or sole earners 40 percent of households with children under 18. Maven has caught investors' attention in the past. In July of 2017, the New York-based startup raked in $10 million in Series A financing led by Spring Mountain Capital. This latest funding news brings the company’s total financing to $42 million. "There are so few companies out there tackling hard-to-solve women's health challenges that are founded by women. 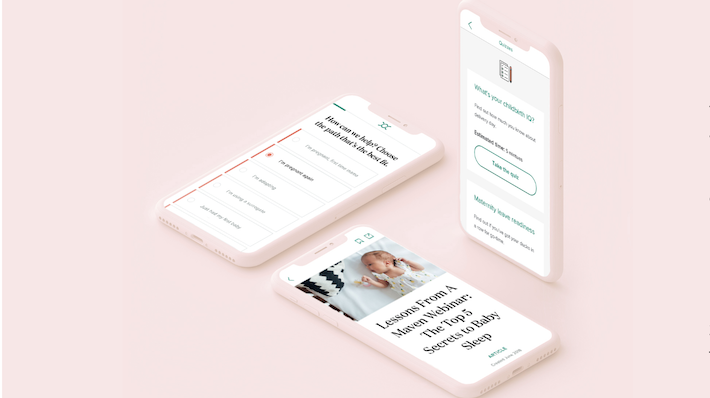 Maven has done an amazing job creating a healthcare solution that helps give women the support they need at work," Jess Lee, partner at Sequoia, said in a statement. "I'm excited to collaborate with Kate and the Maven team to usher in an era of modern health services for today's working families."